Last night, the Introduction to Museology class I’m in at Western University visited Banting House National Historic Site of Canada. We discussed how the Commemorative Integrity Statement for the site impacts its day-to-day operations and why it is such an important document for the museum. It was a neat opportunity for the class to see a local London museum and we also got a great sense of how central the CIS is to Banting House. Now what is a Commemorative Integrity Statement? Very briefly, it is a document that helps to ensure that the cultural resources of a National Historic Site are not impaired or under threat, that the reasons for why a site was designated are being effectively communicated with the public and stakeholders, and that all of the heritage values of a site are being considered when making decisions. For more information on how CIS are established, Parks Canada has a handy guide explaining the process and components that make up the document. But how does this fit with a visit to Banting House? As a National Historic Site, Banting House uses its Commemorative Integrity Statement to help manage its daily activities and decision-making processes. It helps the museum to stay on a path that reflects its messages of national historic significance and can influence collections management decisions. For example, the CIS details what objects are directly related to Banting’s time in London and why those should be seen as the most important pieces in the collection. It can also be used to determine whether or not something should be accessioned into the collection, based on how well it fits with the messages of Banting House. This means that something like Banting’s desk would be more important to acquire and preserve than one of Banting’s paintings from after his time in London, even if it doesn’t have as much monetary value. Grant, the Curator here at Banting House, explained how the CIS was used to decide what to do when the wallpaper that had been in Banting’s bedroom while he lived in the house was discovered under two layers of paint and a layer of wallpaper. Because the CIS states that the objects and structures associated with Banting and his time in London have to be preserved, it was not covered up but was restored under the watchful eye of a conservator. The document was also used to guide the porch restoration project. The exterior of the house was returned to its original character so that it was more similar to when Banting lived here. 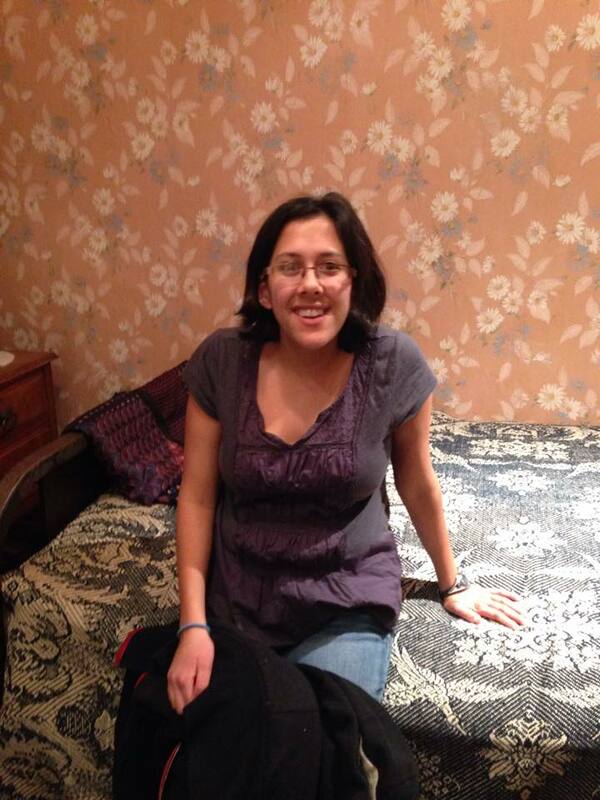 Vasanthi, a student in the Public History program at Western, sitting on Banting’s bed during our visit. Photo courtesy of Rachel Pennington. In order for a CIS to be effective, everyone involved in creating it has to buy in to the ideas and messages it highlights. Banting House NHSC lives and breathes its CIS. You can tell when you come for a visit how inspired the interpreters are by the messages that Banting House shares and how they communicate those to visitors. Using the CIS as a guiding document has helped to make the collection at Banting House stronger and is a great tool to ensure that the significance of Banting’s life and achievements are not lost among the objects.